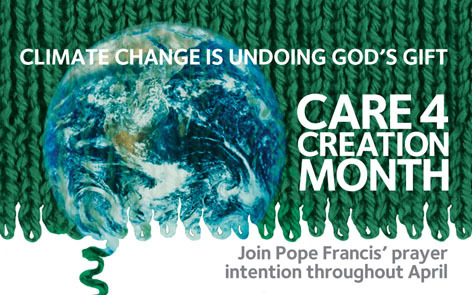 This April, as part of the Global Catholic Climate Movement, we are celebrating Care 4 Creation Month. We would like to invite you to join Pope Francis’ universal prayer intention for creation and prepare for his upcoming encyclical on ecology. Our concern for creation is especially urgent in this time of climate change. There is a strong scientific consensus that climate change is caused by human action and will very likely have catastrophic consequences if not addressed. Climate change is here and now, affecting all countries, but the poor and those without reserves suffer the most. Saint John Paul II, Pope Benedict XVI and Pope Francis have spoken of the urgent need for action on this moral issue (see Catholic teachings on climate change). We encourage you to include the Holy Father’s prayer intention (“That people may learn to respect creation and care for it as a gift of God”) into your personal prayers throughout April. You can find several resources with a Care 4 Creation focus on the Global Catholic Climate Movement website, including Rosary meditations, Holy Hour meditations and daily meditations. Pope Francis told us: “On climate change there is a clear, definitive and ineluctable ethical imperative to act”. The Global Catholic Climate Movement have prepared a Catholic petition addressed to the world leaders who will meet in a U.N. Climate Summit at Paris in December 2015, to urge them to commit to ambitious, pro-life action and solve the urgent climate crisis. We hope that you can join us by signing and promoting the petition. Please visit the Global Catholic Climate Movement website for more information and resources, such as posters and petition forms.